We appreciate your interest in Terra Ceia Christian. God has shown his great faithfulness to us for over 80 years! For your convenience, we have now added the opportunity to complete the application and enrollment process all online, from the comfort of your home (or computer), paperless, and right here on the website. Our scholastic system will track all of your information, place it in a digital file, and keep all of your child's (children's)information up to date. Review our Statement of Faith. You will need to affirm this Statement on the application. Keep browsing our website to find a wealth of information about Terra Ceia Christian School. Come visit Terra Ceia Christian School. We would love for you to tour our building, introduce our staff, and talk about our special program. Call 252-943-2485. 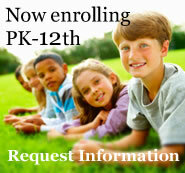 Log on to www.tccschool.com and click on Admissions and then ONLINE Application. You will then create an account, log in, and complete a new application for your child. There is also a $200 Enrollment Fee (per family) that should be mailed to TCCS: 4428 Christian School Rd, Pantego, NC 27860. Bring the Pastor's Confidential Recommendation Form to your pastor so we have a better understanding of your connection to a church. Your pastor should return the form directly to Terra Ceia Christian School. If you are new to the area, have recently moved, or are looking for a new church, that should not prevent you from applying to Terra Ceia Christian School. We do ask that you have a former pastor fill out the form and return it to the school. We will typically give you six months to a year to find the right fit for your family. If you currently have no connection to a church and have not had any past connection, Terra Ceia Christian School may not be an appropriate fit at this time. There are exceptions, but we desire to support families in partnership with a church to bring students to know and love their Lord and Savior. Once you have submitted your application online, the Principal will call to arrange a time where you can meet with the Board. Don't worry! This is a time to get to know you, introduce ourselves, hear how God has been working in the life of your family, and explain some of the opportunities to get involved at Terra Ceia Christian School.